The Green-cheeked conure or Green-cheeked Parakeet (Pyrrhura molinae) is a small parrot species native to the forests of South America. They were previously known as Molina's conure. The species occurs in northeastern Bolivia, northwestern Argentina, western Paraguay, and in Brazil are found in the central and southern regions of the Mato Grosso state. They belong to the genus Pyrrhura and subfamily Arinae, which groups together the long-tailed New World parrot species. However, these small parrots are most commonly called conures in aviculture and are also becoming very popular as pet birds. They are also being selectively bred to create even more color mutations in addition to their natural color forms found in the wild (see color mutations below). There are 6 subspecies currently recognized for the green-cheeked conure. The green-cheeked conure inhabits mainly forests and woodlands at elevations up to 3000 meters. They usually form flocks at treetop level comprised of 10 to 20 individuals, however, larger flocks may occur if there's plenty of food. Normally they will choose to live in the taller trees since it's harder for predators to kill them, and also to reach up to their nests and eggs. Their coloration serves also as camouflage, making it very hard to predators see them against the green treetops when they are perching. For that reason, the green-cheeked parrot has very few predators, the false vampire, a type of bat and birds of prey such as the Ornate hawk-eagle or the Harris's Hawk. In the wild, their lifespan is between 10 and 15 years, but green-cheeked conures can live up to 30 years in captivity. The green-cheeked conure typically measures around 10 inches (25-26 cm) from the beak to the tail feathers tip. Their wingspan is about 5 to 5.5 inches. These little birds weigh from 60 to 90 grams. ​Both adult females and males have an identical appearance, while immature birds have a duller plumage, darker irises, and are less maroonish on the abdomen. Their coloration is mainly green, with a gray, brown or blackish crown, a red abdominal area, and blue primary wing feathers. Their long tail is about 4 to 6 inches long, gradually tapering to the tip and mostly maroon in color. As their common name suggests their cheeks are green colored. They have white rings around their eyes and dark gray feet. The green-cheeked conure bill is shaped like that of other conures and is gray in color. In the green-cheeked conure males and females are identical in appearance. The Green-cheek Conure has become a popular pet bird, mainly due to their natural tendency to be outgoing, cuddly, and playful. Unlike other parrots like African grey parrots or Amazon parrots their talking ability is considered poor, on the other hand, they are considered one of the quietest conure species. Even though the Green-Cheeked Conure plumage is already very colorful in the wild, even more, color mutations are being selectively bred in captivity. Turquoise: These conures have a green or blue-green body coloration, with a grayish breast and gray tail feathers. 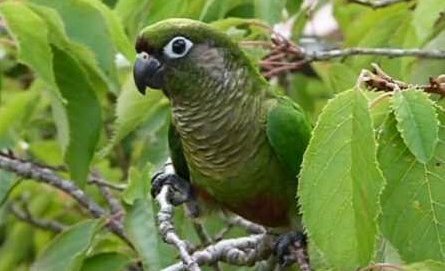 Cinnamon: They are lime green and have a lighter to pale-color plumage and when compared to the wild conures they have a tan colored head and lighter maroon tail feathers. Yellow-sided: Bright yellow sides and breast with some tinges of orange or reddish. Pineapple: This is a combination of yellow-sided and cinnamon mutations, with tails similar to that of yellow-sided and a body coloration like the cinnamon mutation. The Green-cheek conure diet is similar to that of other parrot species. Wild Green-Cheek Conures eat various fruits, vegetables and seeds but occasionally they will also eat insects too. They commonly forage in groups and spend the night sleeping together. While captive pet conures should also be fed with fresh fruits and vegetables supplemented with high-quality commercial pellets. The Green-cheek conure average clutch is around 4 to 6 eggs. The incubation period lasts anywhere from 22 to 25 days. The hatchlings are weaned at 8 to 10 weeks of age. They reach sexual maturity around two years of age. Unlike other conure species, the Green-cheek conure isn't considered endangered in its natural habitat. Although their population size has yet to be quantified, the species is usually described as common, and their population numbers considered stable. They are listed as a Least Concern species by the IUCN red list of threatened species, it's also listed in CITES Appendix II. But still, they face some threat and are likely declining in Eastern Bolivia because of the rapid tropical forest destruction. The deathstalker scorpion is considered one of the most dangerous scorpions species.